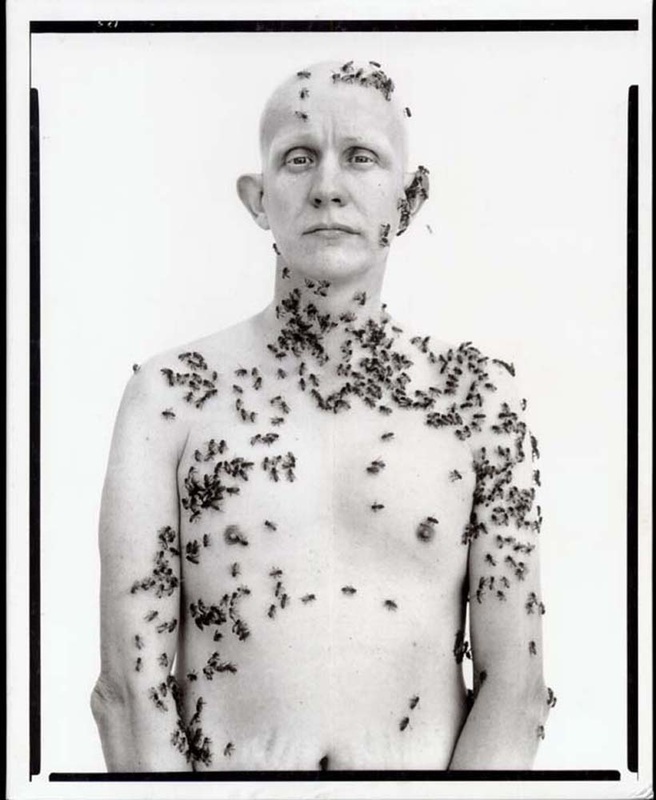 Initially drawn to actors, Avedon also sought out people with a highly cultivated sense of themselves as characters—subjects who could collaborate with him in the creation of an impromptu performance. 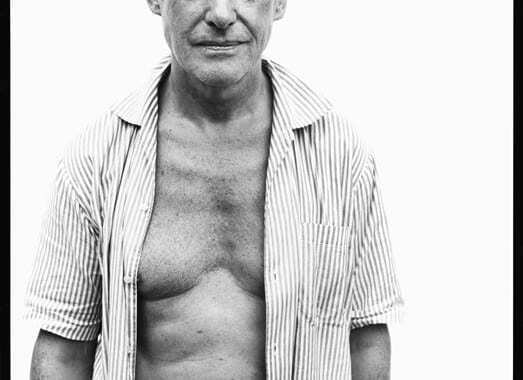 Richard Avedon is a man possessed. Passionate about theater, he may attend the same play week after week, seeking new insight, variant shades of characterization, and changes in his own perceptions. He haunts art cinemas, portrait galleries, and museums, and his thirst for literature, especially for Shakespeare, Chekhov, Proust, and Beckett, is unslakeable; his oceanic library has engulfed his living space and laps at the raft of his bed. Whatever he gleans from his obsessive studies in the secret nature of humanity is turned to account in his work. Although often confused with the fashion photographer and society portraitist, this Richard Avedon works not for gain or glory but out of private necessity. His life work is portraiture, but his pictures are rarely assigned; they are more often self-generated, born of imagination and achieved with collaborators willing to be annexed for a longer life in art. An irrepressible innovator, Avedon has consistently defied conventional expectations about what a portrait is supposed to look like, always avoiding tired formulas—the writer in his book-lined study, the pianist at the baby grand—and offering instead a radically purified approach to the genre. By dint of progressive challenges to himself, he has not only distilled photographic portraiture to its irreducible core, but also has produced an extended meditation on life, death, art, and identity in the form of a vast collective portrait of America in the second half of the twentieth century. When Avedon was ten he became obsessed with the idea of photographing Sergei Rachmaninoff, who lived in the apartment above his grandparents on Manhattan’s Riverside Drive. After staking out the lobby with his Kodak Box Brownie, he managed to capture the composer standing next to a fire hydrant on West End Avenue. “I wanted him to see me, to recognize me somehow,” Avedon told a French journalist years later. “I wanted him to give me something of himself that I could keep, something private and permanent that would connect me to him.” The picture, now lost, of this heroic figure in the Russian Jewish firmament of New York was the first in Avedon’s private pantheon. Autograph collecting, a long-lived and passionate hobby springing from the same desire, led the teenaged Avedon to gather an idiosyncratic constellation of stars. His album, studded with the signatures of writers, vaudeville comedians, classical musicians, and puppeteers, had a special section devoted to “Great Jews and Great Judges.” Also lost, it was a concerted attempt to make a “collection of like-minded people,” a first stab at an idea that in some sense has remained with him for life as he seeks out subjects for his camera. The young Avedon wanted very badly to be a poet; his model was T. S. Eliot, whose brilliant crystallizations of the undercurrents of the young twentieth century inspired him with haunting images of melancholy desire, solitude, and desolation. In 1941, at the end of his senior year and a few days after his eighteenth birthday, he was elected Poet Laureate of the New York City High Schools for his poem “Spring at Coventry,” set amidst the ruins of the British cathedral recently bombed by the German Luftwaffe. Upon leaving high school, Avedon briefly studied poetic composition and philosophy at Columbia University, but he soon took account of his gifts and sagely switched from the pen to the camera. “I realized I didn’t have the intellectual equipment to deal eloquently with the kind of emotional material that compelled me,” he recently explained. Photography offered his roiling emotions a quicker, more conclusive resolution than the patient sifting, gathering, and fitting of words and, even more importantly, “it also appeared not to be about me.” A sensitive, hyperactive youth with a ravenous need to connect and to succeed, he could simultaneously explore the social world and his own emotional predicament by using a camera to relocate his feelings in external symbolic equivalents. A neighbor with whom he had practiced photography became a mate in the photographic division of the Merchant Marine and, grateful for this alternative to the draft, Avedon likewise joined up. As a Photographer’s Mate Second Class, he made mug shots for military ID cards. “I must have taken pictures of maybe one hundred thousand baffled faces,” he has written, “before it ever occurred to me I was becoming a photographer.” Following his release in 1944, he put together a portfolio of pictures and after a dozen attempts, badgered Alexey Brodovitch, the famous Russian designer and art director of Harper’s Bazaar, into looking at it. Accepted into Brodovitch’s classes in photography and design at the New School for Social Research, the twenty-three year old was soon undertaking his first assignments at the magazine. Energetic, aquiver with new ideas, and willing to try anything, he covered the French couture collections; the pictures he made in Paris that first year fairly revolutionized fashion photography and launched a brilliant career. In tandem with this highly public success in fashion, he also made other pictures, most of them portraits, mostly for himself. One of the first keepers was a picture he made in Noto, Sicily, in 1947. From a landscape as barren and elemental as a Beckett stage set (“A country road. A tree.”), Avedon created a bleached-out no-man’s-land; a boy stands there, pushing forward to the front of the picture, his chest puffed up under a lumpy wool jacket, his arms pressed flat against his sides as if to keep them from flying up in sheer exuberance. He is smiling wildly, ready to race into the future. And there, hovering behind him like a mushroom cloud, is the past in the form of a single, strange tree—a reminder of the horror that split the century into a before and after, a symbol of destruction but also of regeneration. By tacit agreement, Avedon’s included, this picture—a kind of projected self-portrait— has come to stand for the artist’s youthful self, for it fixes a moment of propulsive glee mutually mirrored in photographer and subject. Later, Avedon rarely made portraits in which any element other than the sitter is visible, but here already he had begun to divine that backgrounds were distracting and middle and foregrounds intrusive: the soul of his art was more comfortable in an undefined world. Once fully immersed in fashion at the Bazaar, Avedon felt a part of himself stranded. To get back to the heart of his concerns, which he now located with some certainty in the theater, he left Brodovitch and the magazine in 1949 to become associate art editor at Theater Arts Monthly, a position that netted him tickets to the shows and enabled his portraits of actors. Those with highly developed, vocational understandings of the face as mask, such as vaudevillian Bobby Clark and silent movie master Buster Keaton, were magnets for him. He also wanted to make portraits that bristled with emotional expressiveness without resorting to the artful backlighting and slick, patent poses of celebrity portraits by such photographers as Edward Steichen and Anton Bruehl. He tried photographing performers in mid-act, such as Martita Hunt in Giraudoux’s Madwoman of Chaillot and a ghoulish Fredrick Ashton in Sleeping Beauty. Although the pictures are not convincing and the job at Theater Arts proved unsatisfactory after a few months, it confirmed Avedon in his pursuit of subjects who could actively express the roles they inhabited. Soon he had Brodovitch letting him make the kind of portraits he wanted for Harper’s Bazaar. The November 1955 issue included Avedon’s feature on the Metropolitan Opera, a suite of portraits that included the contralto Marian Anderson wholly immersed in her art—a stunning image of song incarnate. Initially drawn to actors, Avedon also sought out people with a highly cultivated sense of themselves as characters—subjects who could collaborate with him in the creation of an impromptu performance. Among them were two poets delivering opposite readings of their calling as “literalists of the imagination,” in Marianne Moore’s words—Ezra Pound, the passionate declaimer versus Moore, precisionist phraser. At other times Avedon dismantled his sitters’ carefully crafted personas, portraying them instead as they might not have wished or expected to be seen. In his portrait of Isak Dinesen, he intensified the Danish writer’s theatrical mannerisms to such an extent that out of the artifice sprang a condensed kernel of truth. “We met in a hotel in Copenhagen,” he recalled, “She arrived wearing an enormous wolf-skin coat and her first words to me were, ‘I judge people by what they think of King Lear.’ I was completely intimidated.” He summarized his deeper view of the matter in the two portraits that resulted: a pale, cadaverous head atop a dark pillar of fur, and a close-up capturing her manic, devouring gaze. Dinesen’s imperiousness, her bravado, and her underlying doubt, rise to the surface and invest the pictures with a terrifying honesty. Also unmasked were the Duke and Duchess of Windsor—the leading couple in a political soap opera played out on the world’s stage—whom Avedon had watched for nights at the roulette tables in Monaco, noting their reactions to loss, and whom he lured into reprising their losers roles for the instant of his photograph. He was registering not so much the cost of a kingdom but a moral deficit, a flaw of character. In this mode, however, Avedon is not always harsh. He approached Groucho Marx with love in his eye, portraying him not as a popular prankster but as a wise elder statesman of Jewish culture; he took a wise elder statesman—a five-star general and former President of the United States—and portrayed him not as the avuncular Eisenhower of popular myth but as a man who truly knows the horrors of war and the dangers of misplaced power. The famous portrait that resulted from this session is a study of the complex nature of celebrity. Entombed in her body, Avedon’s Marilyn is a secular Madonna mourning some indefinable loss. The picture is imbued with a sense of interiority that seems worlds away from the rigid mask in Andy Warhol’s posthumous silk screens of Marilyn as a gaudily glamorous Pop icon. While Avedon’s portrait foreshadowed the tragic figure Marilyn would soon become in the popular imagination, Warhol’s silk screens, made shortly after her death from a drug overdose in 1962, have the still and distant quality of memorials. Yet neither Avedon’s humanist portrayal of a sad seductress nor Warhol’s lurid canonization of her vivacious, wet-lipped counterpart reveals the real Marilyn Monroe. The truth of Avedon’s portrait lies in a new character, a melancholy heroine collaboratively created by the photographer and his subject. In 1969 Avedon began using an eight-by-ten-inch Deardorff view camera on a tripod—a cumbersome and demanding piece of equipment that brought with it a new way of working and a new set of constraints. Rather than moving with the Rolleiflex at his waist, he was now standing beside a large box with a static lens. No longer a mobile extension of the eye, the camera became a silent witness to the concentrated face-off between photographer and subject. The mug shots of young recruits posed against a plain white background that Avedon made in the Merchant Marine offered an early intimation of his mature portrait style. Born of the nineteenth-century fascination with physiognomy and criminal classification, the mug shot is the purest—and most purely photographic—form of portraiture. 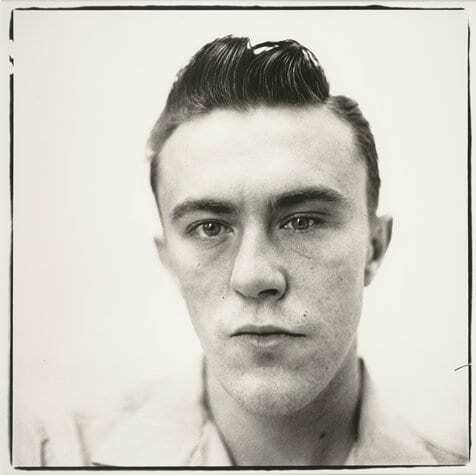 A standard mug shot, with its blunt frontality, uniform lighting, and set proportion of head to frame, strips away all extraneous elements, establishing a stringent formal neutrality that presents the unique configuration of the subject’s face as its primary content. Now he adapted the rigorous, stripped-down purity of this format, pushing to its farthest limit, and in the process, elevating it to the level of serious art. Using the Deardorff, Avedon generally poses his subjects against a plain white seamless backdrop, illuminated by shadowless, diffuse sunlight or by a similar kind of flat, studio lighting. Because the camera’s shutter speed is slow and the depth-of-field is shallow, the subject cannot move much without throwing something out of focus. Because of the tight framing and Avedon’s commitment to using the entire, uncropped sheet—black borders and all—the subject cannot shift or slump, and must remain attentive and finely attuned to the discipline of the process. There are no props; there is nothing to lean on or hide behind. “I’ve worked out of a series of no’s,” Avedon explains. “No to exquisite light, no to apparent compositions, no to the seduction of poses or narrative. And all these no’s force me to the ‘yes.’ I have a white background. I have the person I’m interested in and the thing that happens between us.” With everything inessential stripped away, what remains is a pure opportunity for engagement, ranging from close connection to a more reserved confrontation, with innumerable feints, detours, dead ends, and digressions in between. Finally an endgame is reached when the more practiced player, having scrutinized every move and countermove, knows he has arrived at the win-all exposure. Although Avedon’s white-background portrait style evolved out of a personal set of artistic preoccupations and pictorial solutions, his approach reflected a certain ethos of reduction and distillation that emerged in the art of the mid-sixties. By this time the painterly facture and expressive gestures that characterized the art of Pollock and De Kooning no longer contained the truth many younger artists sought. The new tendency, initially more an attitude than a practice, was laid out by Ad Reinhardt in his 1957 manifesto, “Twelve Rules for a New Academy,” in which he sketched his reductive approach to painting as a list of prohibitions: no texture, no brushwork, no drawing, no forms, no design, no colors, no light, no space, no size or scale, no movement, no subject. Reinhardt’s writings and his notorious black paintings stimulated a number of younger artists—including Donald Judd, Carl Andre, and Robert Morris—to further refinements. Rejecting the traditional notion of the work of art as a discrete and self-contained object, these artists turned their attention to the present-tense perceptual experience of the viewer and the qualities of the exhibition space itself. Purged of all excess, their spare, geometric volumes activated the surrounding architecture, focusing and intensifying the viewer’s somatic responses to scale, space, and light. What Avedon shared with these artists was not only a commitment to a stylized simplicity, but also a sensitivity to scale and an implicit acknowledgment of the embodied presence of the viewer. Already in 1962 he had made big enlargements of his pictures for display at the Smithsonian Institution, and for his landmark exhibition of portraits at New York’s Marlborough Gallery in 1975, he produced spectacular wall-sized versions of several images. The resulting larger-than-life figures that made the viewer feel like Gulliver among the Brobdingnagians were sensational in the original, literal meaning of the word: they reacquainted the viewer with his bodily sensations. One could not see the show without being pressed into a confrontation with the people depicted on the walls, and the vividness of the portrayals combined with the rocketing emotions most visitors experienced made it a show unlike any other. Avedon had forced his public to feel, but coercion was nowhere evident. Rather the whole installation and virtually every image in it seemed restrained, elegant in the extreme, cool, and yet somehow intensely personal. Although Avedon never pursued the project, its usable residue shaped the Factory portrait of 1969. Working in his most directorial mode, the photographer began with all his actors jumbled together in a single frame. Gradually, as he moved them around, he found he needed to expand the space. He broke the group into smaller clumps, isolating and highlighting certain figures, and the Factory spread out in a lateral frieze across four frames that abutted one another. He embedded a narrative in the scene, as Joe Dallesandro moved across the frieze from left to right leaving the trace of an implied time lapse in his passage. The denouement—Warhol filming Dallesandro coupling with a woman on a mattress—occurred in the far right frame. That frame Avedon ultimately cut out of the work, leaving the reason for the internal movement ambiguous. In the three remaining frames, the Factory “workers” in various stages of dress, undress, and dishevelment mill about in an appropriately equivocal expression of on-flowing stasis, to which Avedon added a satiric charade of the three male (as opposed to female) graces, a play of hands owing much to Renaissance painting, and an emotional blankness not unlike Warhol’s affectless demeanor. Exquisitely attentive to every detail of the interplay of figures and their graphic positions against the white ground, Avedon created a tour de force cycle laid out flat, as if the figures progressing around the belly of a Greek vase had paused for the photographer’s camera before resuming their rounds. Once he had photographed the Factory, Avedon realized that he could handle other groups with his multi-panel technique, and, as antiwar protests shook the establishment, he went to Chicago to photograph the Chicago Seven, a group of radicals on trail for conspiring to incite a riot at the 1968 Democratic National Convention the previous year. A year and a half later, he traveled to Vietnam to depict the Mission Council, the highest-ranking military and civilian managers of the American side of the war. With the latter two groups, Avedon adopted a non-committal, deadpan attitude—as if he were simply a police photographer documenting a lineup of perpetrators. This approach also guided his work on The Family, a group of sixty-nine photographs of heads of state, union leaders, bankers, and media moguls—a composite portrait of the power elite—published as a special issue of Rolling Stone in 1976. Although his innate sympathies were with the dispossessed and his liberal politics are woven into his work in subtle or not so subtle patterns, with The Family, Avedon scrupulously tried to avoid expressing any opinion about his sitters, preferring to let them pose and photograph themselves so that his prejudice would not skew the results. This postwar mood of bleakness leavened by hope has never left Avedon’s portraits. It is there in his great two-panel portrait of an aging Beckett, dressed in a black turtleneck and dark wool suit, looking like the very embodiment of courageous pessimism, and in his explosive portrait of Oscar Levant, the pianist and Hollywood raconteur, as a divine madman caught between a laugh and a scream, howling into the Void that has somehow crept into his Beverly Hills bungalow. The carnies and drifters Avedon photographed as part of his five-year-long project, In the American West (1979–84), are like younger, American cousins of Beckett’s gentleman tramps—elegantly ravaged antiheroes suspended somewhere between comedy and tragedy. The mood is there in his picture of Noto, with its mushroom cloud, and again in his almost otherworldly portrait of J. Robert Oppenheimer as a fallen angel in a three-piece suit, a humbled and mystified destroyer of worlds. Like the books by the writers he admires, Avedon’s photographs address the largest themes—intimacy and alienation, presence and self-estrangement, honesty and deception, struggle and acceptance, love and death—but what anchors these notions in the concrete is the intensity of his characterizations. The people in the pictures seem posed to walk right out of their frames, immediately recognizable and wholly alive down to the most telling detail. “I have a great faith in surfaces,” Avedon has said, “a good one is full of clues.” These precise visual clues—Polly Mellen’s quizzically tilted head, Renata Adler’s drifting left eye, the way Brodovitch pinches a lit cigarette between the thumb and forefinger of a hand wrapped around the padded handle of a metal crutch—are preserved in the portraits like flies in amber. 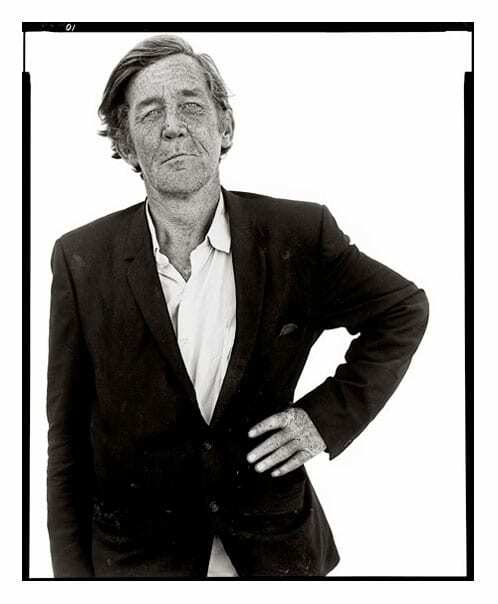 Laureate of the invisible reflected in physiognomy, Avedon has become our poet of portraiture. His observations of our hidden life are recognitions, like images of one’s ancestors whose resemblance to oneself is undeniable. The various facets of his character, transmuted through others, and the facets of others’ characters, transmuted through him have merged into a kaleidoscopic vision of the human condition represented as a gallery of modern souls as intense and vivid as any ever achieved. Posted in Artist Short List, Essays and tagged Essay R, Maria Morris Hambourg, Mia Fineman, Portrait, Richard Avedon, The New York School.